"Breakaway reads like an international political spy thriller. A must-read for fans who want to know about the history of the game, who some of the great European players were, and the development of the global game as we know it today." 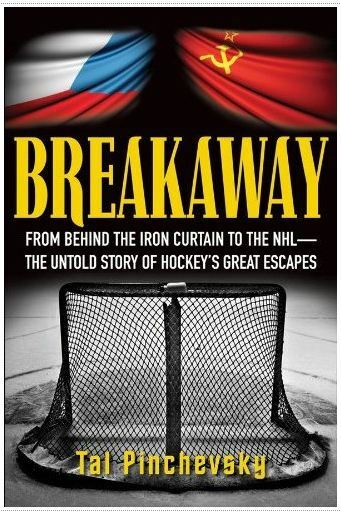 The book tells the story of many of hockey's famous players who had to defect from behind the Iron Curtain to play in the National Hockey League. These brave souls left behind their families and the world as they know it to come to a completely foreign land to chase a dream. When I first learned of this project more than a year prior to it's publication date, I must admit it skyrocketed to the very top of the my most anticipated book release list for 2012. I have always had a fascination with every aspect of these defections. Pinchevsky delivers to my high expectations and then some in a truly excellent book. He tells the incredible true stories of the trailblazing men who risked everything to pass through the Iron Curtain and become NHL superstars. Through exclusive interviews does not only tell the players story, but that of the families left behind, the people who helped make it possible and the people who welcomed them to their whole new world. Much of the stories are told in the first person. The book offers emotional looks at Peter Stastny, Igor Larionov, Petr Klima, Petr Nedved, Sergei Fedorov, Slava Fetisov, Alexander Mogilny, and other hockey superstars captured the imaginations of fans around the world. Pinchevsky blends political and hockey history with deeply personal and emotional stories and a sense of adventure. It's several books all rolled up into one. This is just a fantastic read folks. I highly recommend it. Update: Pinchevsky only looks at the bigger names who defected - Nedomansky, the Stastnys, Mogilny, Nedved to name a few. He also looks at the likes of Igor Larionov, Viacheslav Fetisov and Sergei Fedorov, who technically were never defectors as their long struggles resulted in legal relocation. I wanted hockey fans to know that there quite a few more defectors that the book does not mention. Some time ago my old buddy Patrick Houda and I tried compiling a complete list of defectors to the National Hockey League. Patrick, being the amazing researcher that he is, was able to identify a few others who never played in the NHL at all. He speculated that there are others who played professionally in western Europe, but he is confident we have a complete list of notable defectors.